What is the downside risk for the TSX Index? 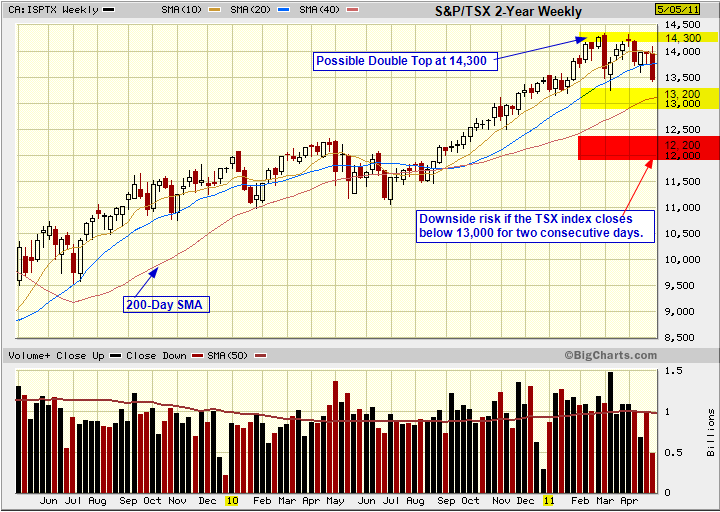 What are the key points from the above chart of the TSX? There is the possibility of a double top at 14,300. Major support on the weekly chart is 13,500. Reference the previous chart. I use a two-day time filter and a 2% penetration rule based on the closing prices. 13,500 will become resistance if the TSX closes below 13,500 using the above filters. 13,200 (near the March 7 retracement of 13,250) would then become major support. Using the above filters, a closing price of around 12,900 would confirm a double top. The downside risk would then be around 12,200. This entry was posted in TSX Index and tagged candlestick, candlestick charts, Technical Analysis, TSX on May 6, 2011 by Trader.